I am in the process of gathering together all the different projects I have completed over the years. More recent projects will always appear at the top. I have included links to past blog posts that are related to each one. I will continue to update the gallery with new projects, so keep checking back. I may even post projects from when I was a kid, so stay tuned. ​English Paper Piecing Design: "Squared Off"
This English Paper Piecing design is based on a traditional tiling motif consisting of a square rotated to an angle. When repeated side by side, this rotation creates square "holes" to be filled. I chose alternating light blue and orange for the main part of the blocks, with a sparkly yellow fabric with white spots. The fussy cut design began as a herringbone pattern with perpendicular stripes. The effect is that of a square within a square within a square. The appearance of an additional overlay of a white grid makes the eye move from one pattern to another. Felt pouches have a myriad of uses from holding business cards to protecting jewelry, or adding that handmade touch when presenting a gift card to a friend. 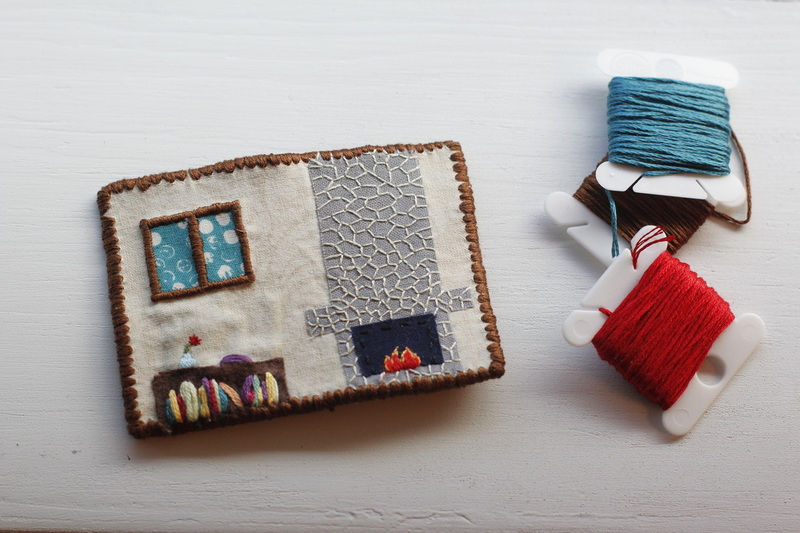 You can sew up a bunch in a snap or go the extra mile and make patchwork felt fabric. They can also be customized with a lining, a favorite button, or embroidery. Whatever you choose, these little pouches are sure to impress. 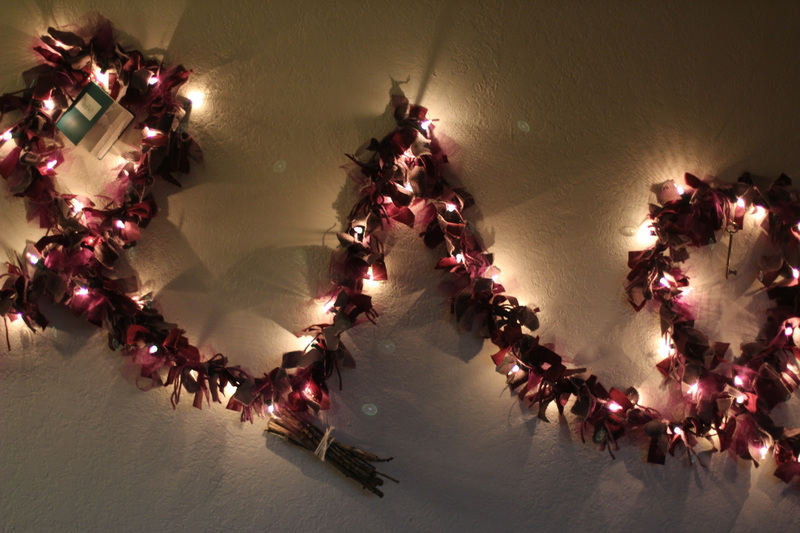 Making decorations is time-consuming, but the results are beautiful and last much longer than store-bought ones. These signs are no exception. 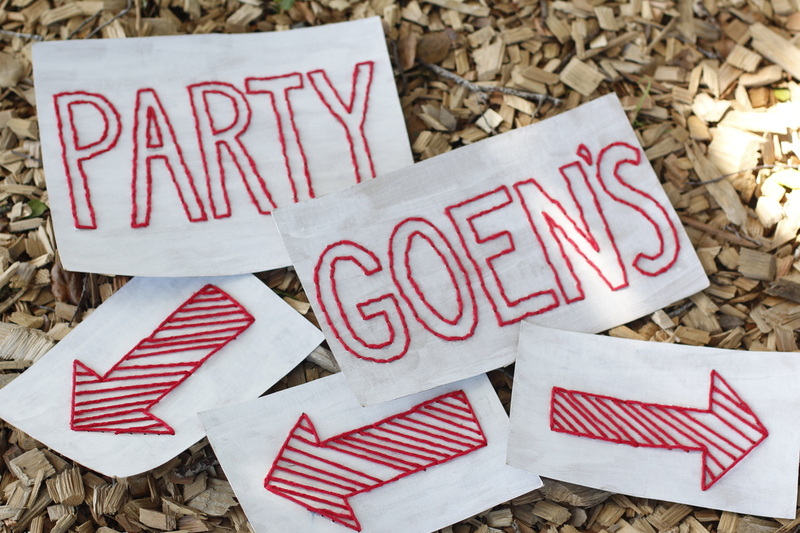 Beginning with strong cardboard, just paint over it and trace a simple design or word. 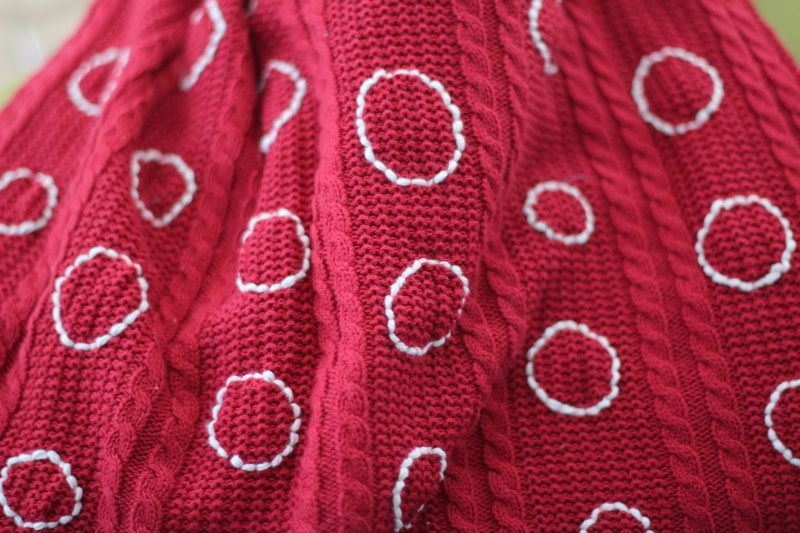 Holes poked at regular intervals provide a route for a tapestry needle and yarn to pass through. Running stitch or back stitch is all you need to know for this project. A little irregularity gives the final piece so much character, so go for it! Geese and goslings soar across this mini on a rainbow background. The solid fabrics are interspersed with a feathery gray print that provides a bit of movement and flair to these stationary birds. The quilting was kept simple, with a line of stitches on either side of the goslings and a connected chevron motif encircling the larger birds. The backing continues the theme with my own hand-carved stamps of a goose in flight and the words "flying goose" in flowing script repeating across it. The magenta printed binding is the perfect finish and frames the mini in style. For my second English Paper Piecing design, I drew inspiration from the diamond plate that covers the quintessential "man's garage." Rendered in pink and gray, the masculine becomes feminine. The design can be kept simple to accentuate the shapes, or the motif can be made more subtle through the use of more closely matching colors. With only two shapes in a repeating pattern, this design is great for beginners. Although I have always lived in Coastal California, winter still makes me think of snow, a cozy fire, and books to last the winter. All this, and more, appears in my piece. The fire is embroidered with single strands of floss that capture the details and subtle changes of the flames. My favorite part is the dainty flower in a tiny vase sitting atop the bookcase hinting at the warmth that will inevitably follow winter's chill. 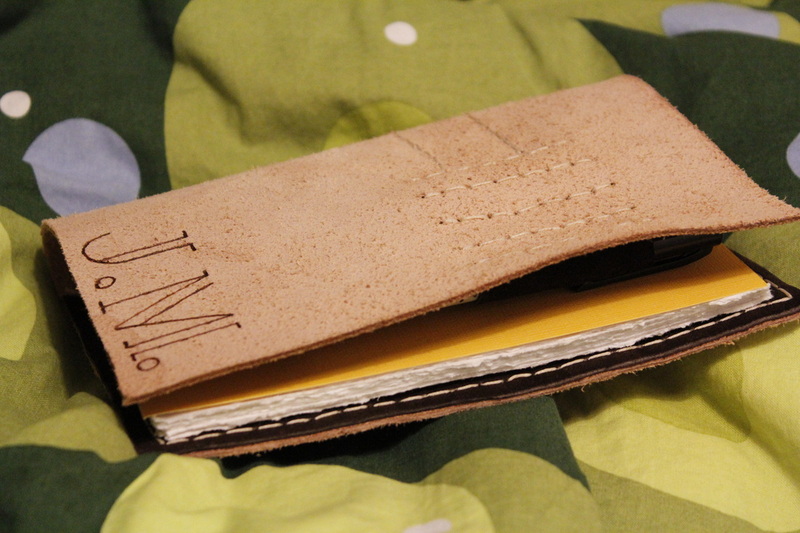 The back of the card is split hide leather with the swap information burned into it. The two layers are attached with a hand-embroidered edging that frames the scene well. 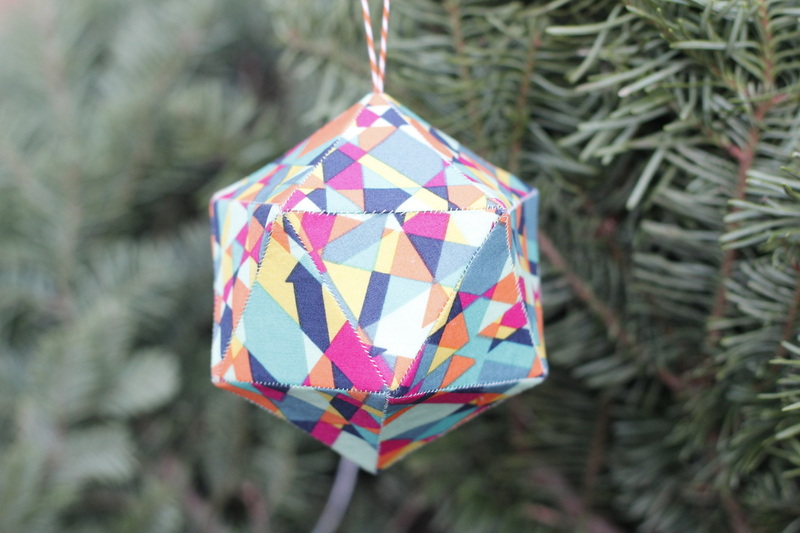 Geometry is at the center of this 3-D ornament. Known as an icosahedron, this ball contains twenty equilateral triangles. The inspiration came from looking through images of origami and wondering how to translate them to fabric while maintaining the stability of paper. The result is an ornament that can stand the test of time, that can cope with the wear and tear of holidays with children. And the construction uses the same techniques as English Paper Piecing. The fabric I chose is an AGF print that exudes the same level of geometry, but in a fun, colorful way. It's an ornament fit to grace your halls all year long. This quilt is made using the Roman Square. The top is sewn from coordinated batik fabrics in purple, coral, and taupe. 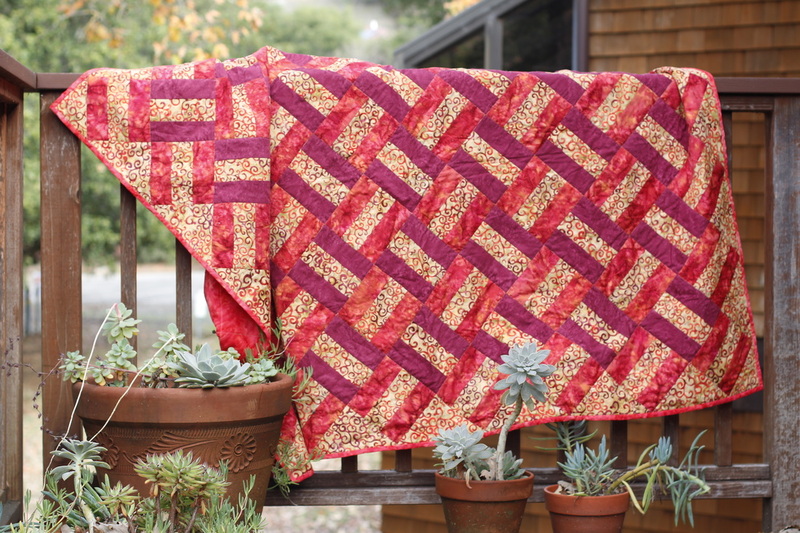 The swirl fabric at the center of every block creates a sense of movement, while the semi-solid purple and coral strips give the quilt stability and grounding. 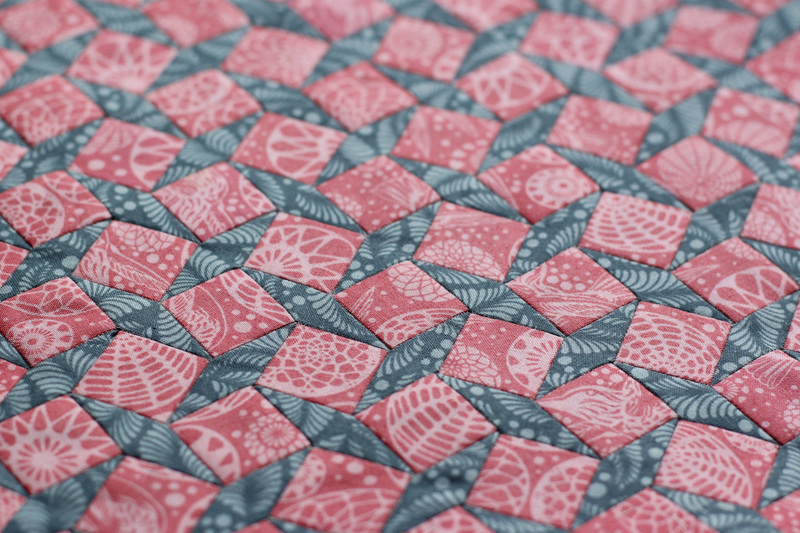 The backing and binding are from a similar coral-toned fabric. I went with a simple stitch-in-the-ditch method of quilting that surrounds each of the blocks. The taupe quilting thread shows in places, giving the quilt an antique feel that is perfect when paired with the batik swirls. 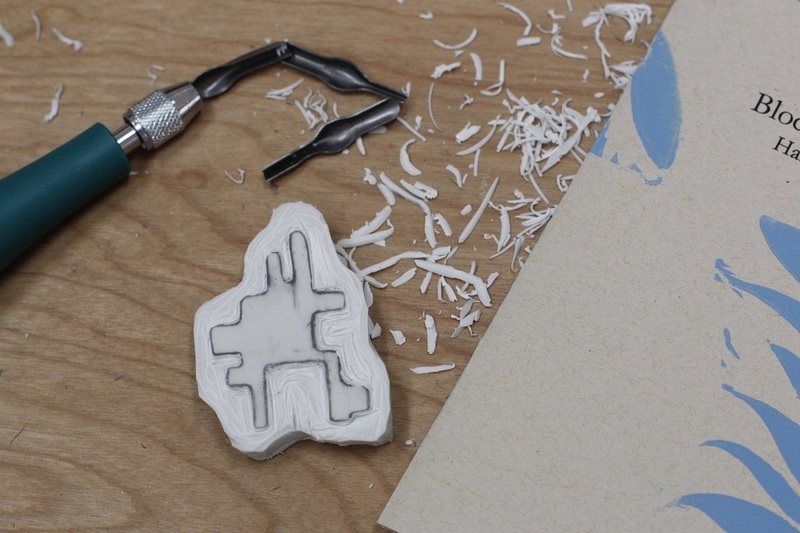 I designed this stamp to create an interlocking repeating design. Each side fits perfectly with its opposite. The resulting pattern is reminiscent of modern, abstract art images of human or animal figures simplified to their most basic elements. I went on to create more detailed stamps that I used for printing yardage. After being given an envelope that had been constructed from a simple rectangle folded and stitched with a zig-zag, I redesigned the shape to create notecard-sized envelopes that are perfect for sending a greeting to a special friend. These were used to send polaroid blocks for a sewing swap. The beautiful geometric prints on rugged cardstock were perfect for keeping the blocks safe in the mail. Almost any paper will work to make an envelope as simple as this! 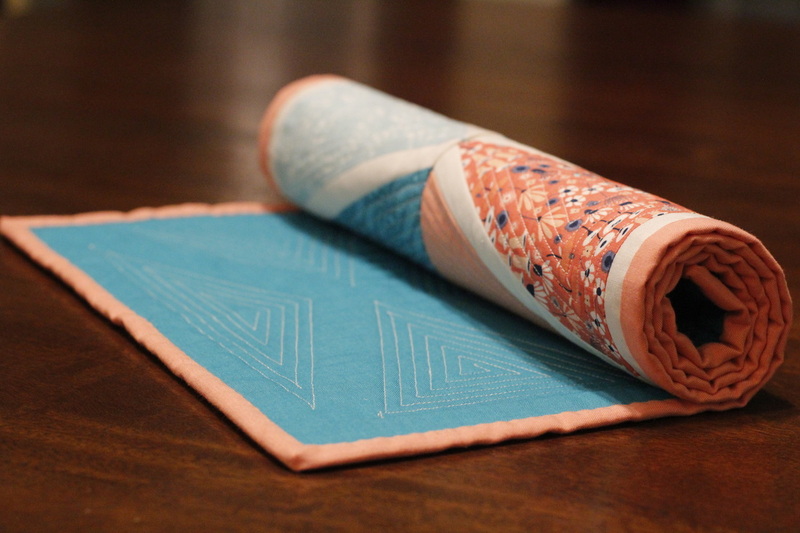 Although made for a mini quilt swap, this long, skinny mini was meant to be a table runner. The simple design is made up of triangles, half of which meet at the center to form diamonds. Most of the fabrics are Cloud9 organic prints and solids, with some Kona sashing. 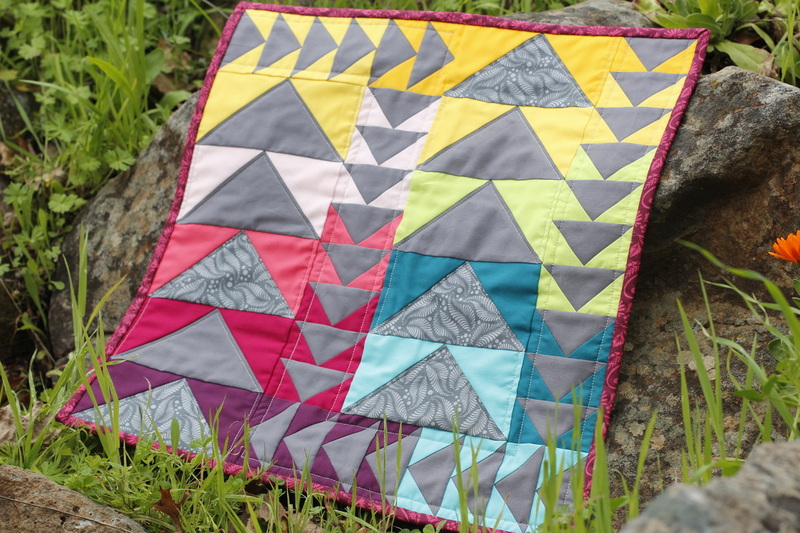 The spiral quilting emphasizes the triangle and diamond motif, and looks just as beautiful from the back. ​The inspiration for my first Artist Trading Card swap was my home town, the place where I spent more than twenty years, both as a child and young adult. The tiny stitches depict the restored train depot on the left, the building with the clock tower, and three trees representing the orange, lemon, and avocado trees that are the main crop of the area. The initials of the town are even emblazoned on the hills that sit beneath white fluffy clouds and bright sunshine. It's a place I love! 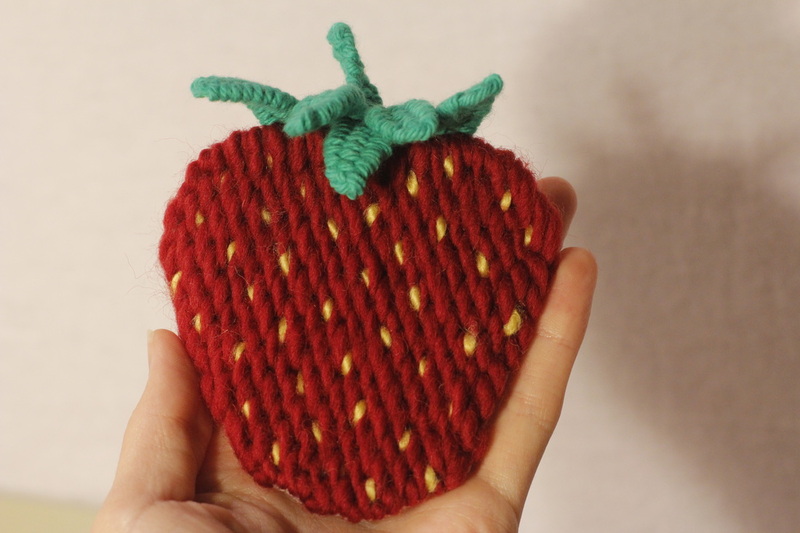 This strawberry patch is embroidered on osnaburg fabric using wool and cotton yarn that is soft and wonderful to touch. The stem and leaves were made using a three-dimensional weaving technique that adds texture and interest. These bulky patches would look great on a bag, jacket, or other item as a show piece. English Paper Piecing Design: "Burst"
After reading All Points Patchwork by Diane Gilleland and sewing a few hexagons, I decided I was ready to start making my own patterns. I started small, though, and used a geometric tessellation coloring page for the basis of my first pattern. I changed it up a bit to make sure it conformed to the "rules" of English Paper Piecing, and to make it suit my style. "Burst" was the result. After being challenged to make a mini quilt that included the chartreuse, I stitched up this piece with a bright color palette using the Swoon quilt block pattern by Thimble Blossoms. 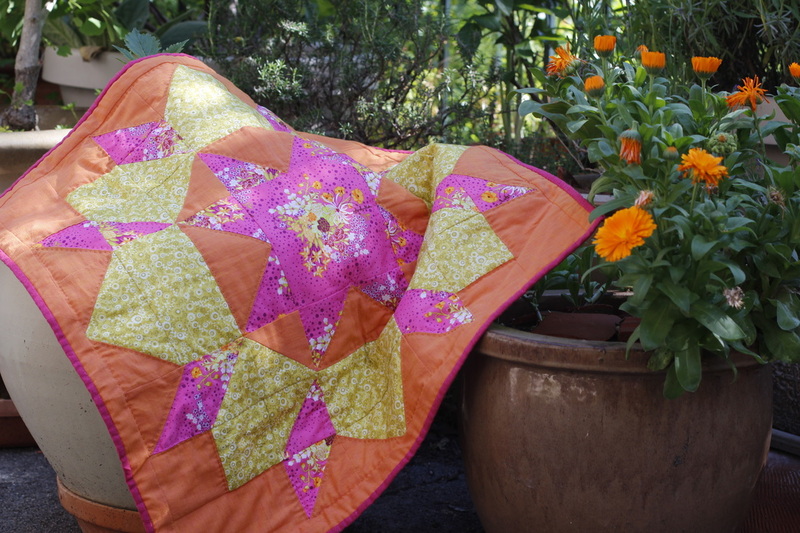 The center square was fussy cut from a flower print that includes chartreuse and orange, pulling in both colors used in the rest of the mini. I finished it off with a bit of hand quilting and a personalized, hand-embroidered label on the back. Aside from the stuffing, this doll is made entirely of all natural materials. 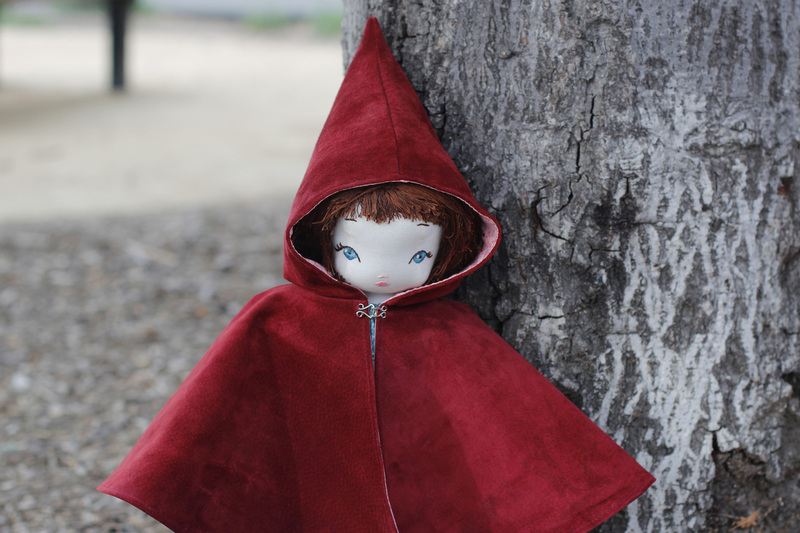 The body, dress, and cloak lining are made from cotton fabric, the cloak and shoes from leather, and the facial features and hair from cotton embroidery floss. Every lock of hair was stitched directly onto the head. Although time-consuming, the effect is amazing. 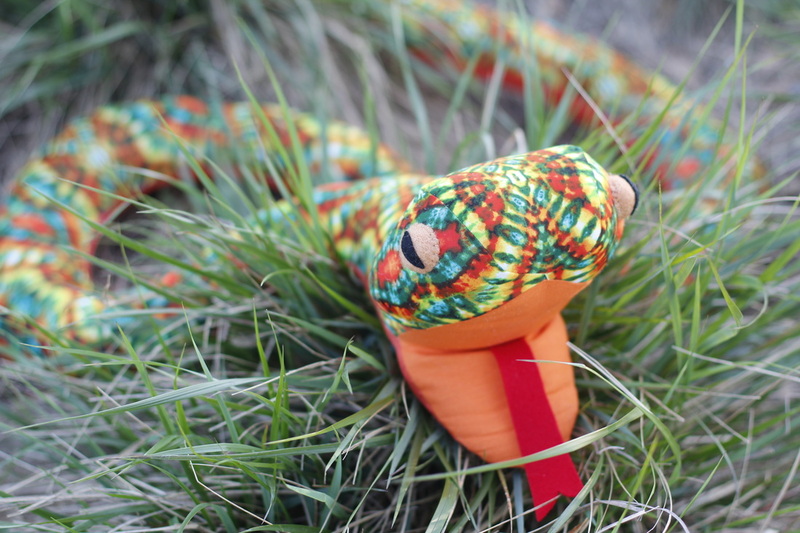 Made from tie-dyed print knit fabric, this snake practically jumps out at you from his hiding place in the grass. A coordinating orange cotton belly and realistic-looking eyes made of wool felt complete the look of this super-scary snake. 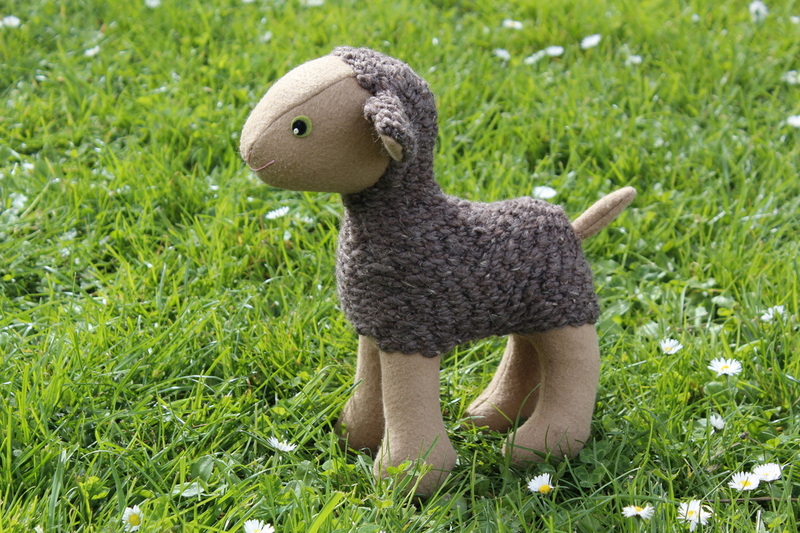 After receiving a request to write a tutorial for Sew Mama Sew, I made another sheep, this time in brown. The yarn has a beautiful texture, with strands of dark and light mixed in. And the green wool felt eyes pop against the light brown face. Spurred on by a sewing swap assignment, I altered a pattern from Bustle and Sew to make a mouse pincushion. 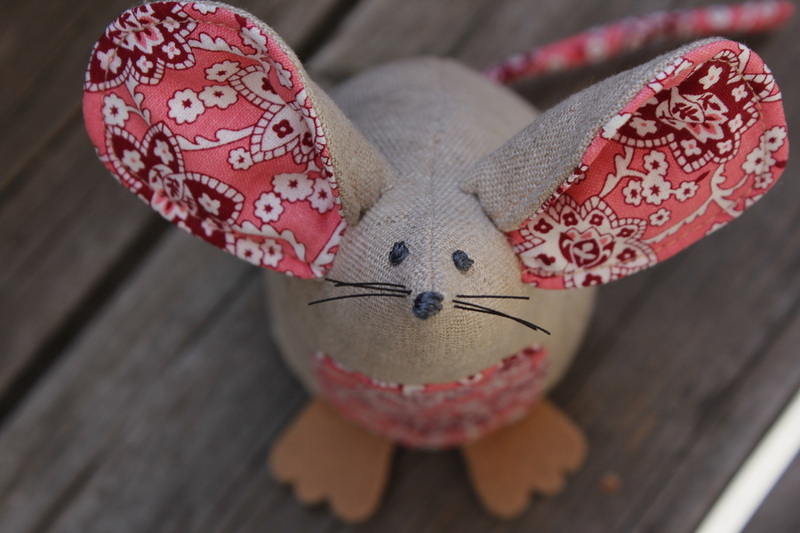 With a tail, inner ears, and belly in designer quilting cotton, felt feet, and embroidered features, this mouse will sit proudly on any sewing table. 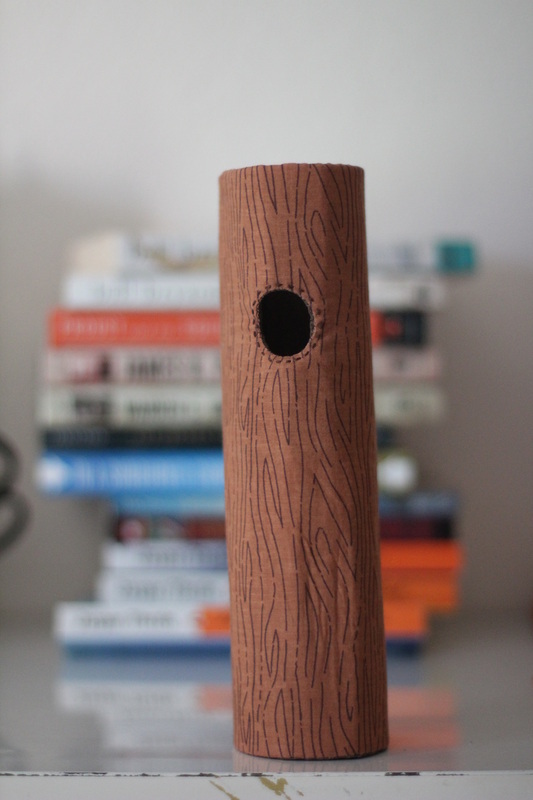 Plus, the bottom is filled with crushed walnut shells for stability. 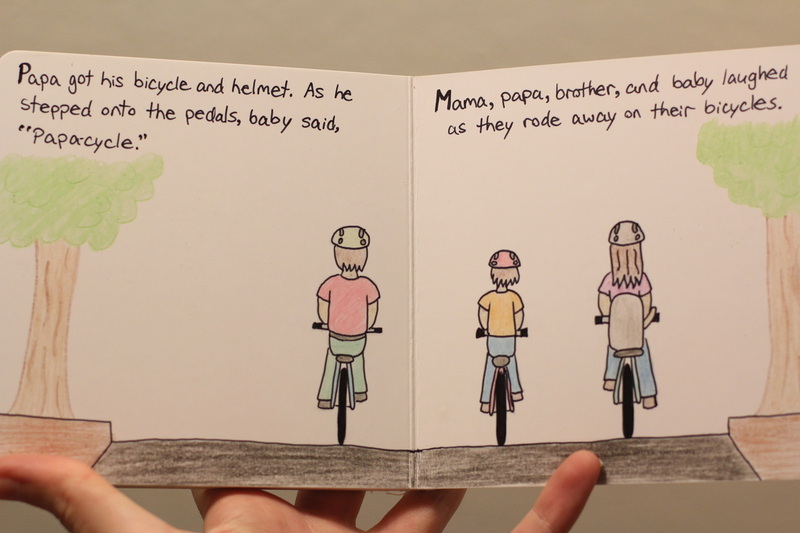 This children's book, titled A Bicycle for Brother, was written for my son when he was a toddler. After purchasing blank board books, I attached two together and then wrote and illustrated the entire story. Although written for children, it is also enjoyable for the adult reader. Made from split veg tanned leather and dark brown leather suede, this sketchbook cover was stitched by hand. It can hold a 5 x 7 sketchbook, four writing implements, and an eraser. The cover has the recipients initials burned onto the bottom front corner. 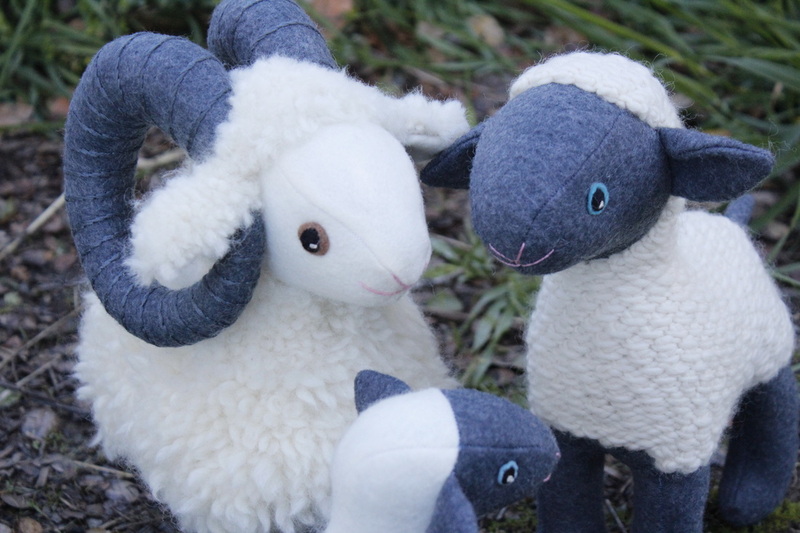 An adorable family of sheep made from a pattern in Abby Glassenberg's book Stuffed Animals. The fur on the ram and ewe was hand embroidered using 100% wool yarn. Embroidered felt eyes and horns add an artistic touch to this bunch. 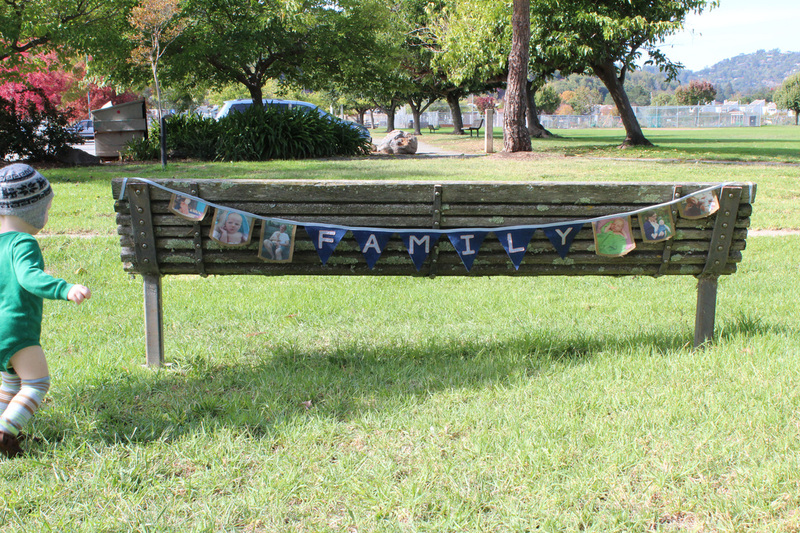 Made as an entry for the Wisecraft Handmade book release contest, this bunting banner spells out the word "family" in appliqued and embroidered fabric. The pictures on either side are printed on muslin and fused to burlap. A length of light blue bias tape holds it all together, the long ends providing a convenient way to hang it. 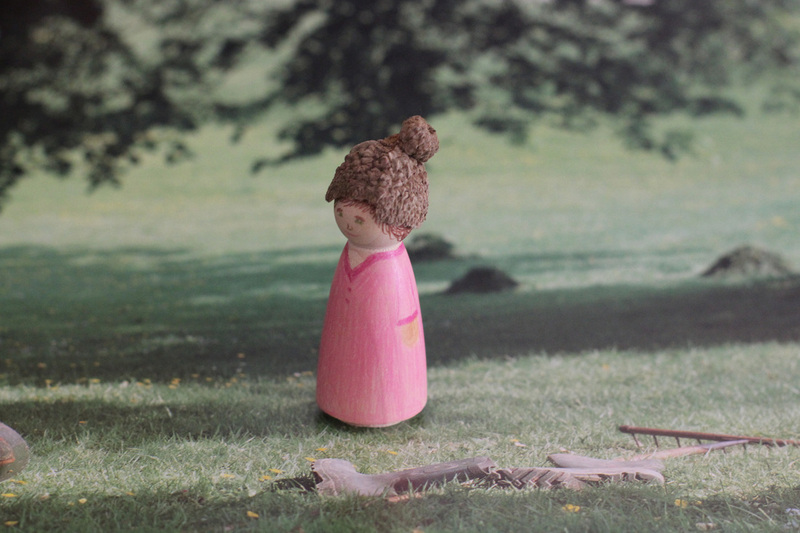 This peg doll woman has been decorated with colored pencils. Her simple features provide ample room for imagination and the acorn-top hat adds a whimsical feel. 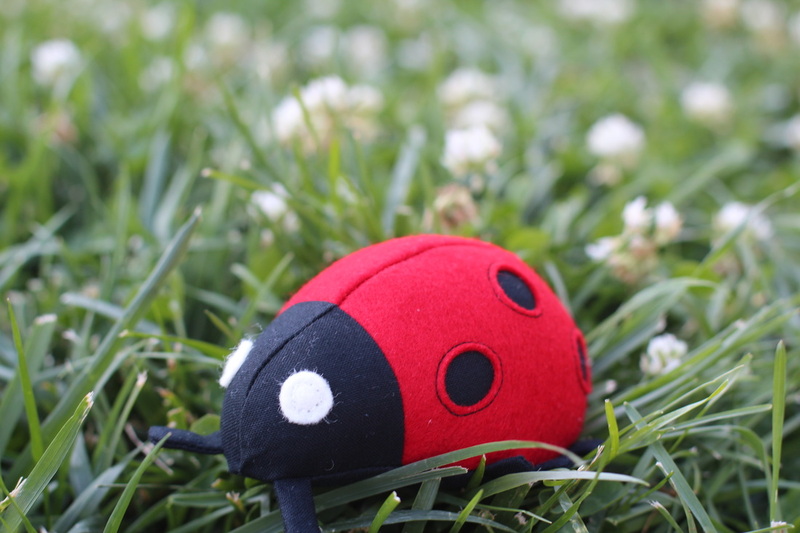 Made from wool felt and cotton, this realistic ladybug looks ready to fly off the page. The spots are reverse-appliqued to give added dimension, and the contrasting black thread helps the eye move gracefully from the head to the wingtips. Made from an empty plastic sugar bag, this sketchbook has a built-in zippered pencil case. When the book is filled, the pages can be removed and new ones stitched in or the cover recycled. Based on an idea from the book The Story Vine by Anne Pellowski, I created my own story vine from a strand of lights, fabric scraps, yarn, and ribbon. The ornaments hanging from it represent stories, both made-up and real-life ones. Some are handmade and others are found items. 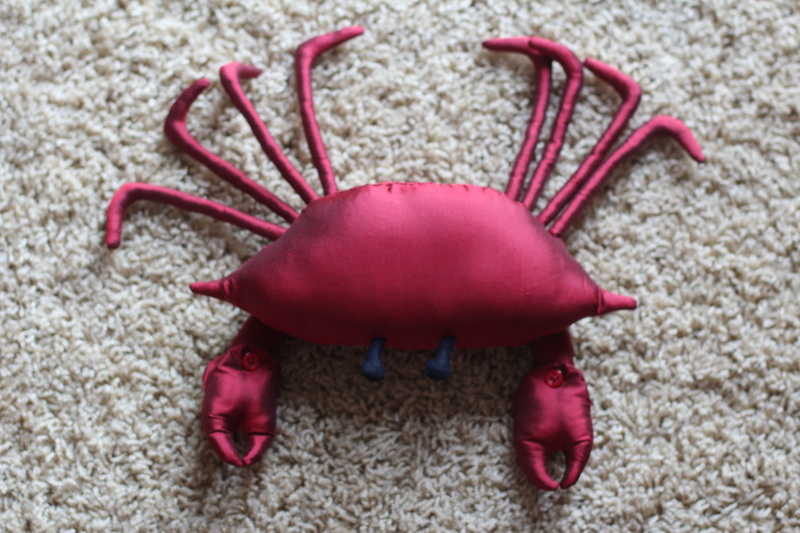 This long-limbed crustacean is made from 100% silk dupioni fabric using the pattern from Abby Glassenberg's book Stuffed Animals. The eyes are navy cotton and the claws are attached using matching red buttons. Another creature from Abby Glassenberg's book Stuffed Animals. 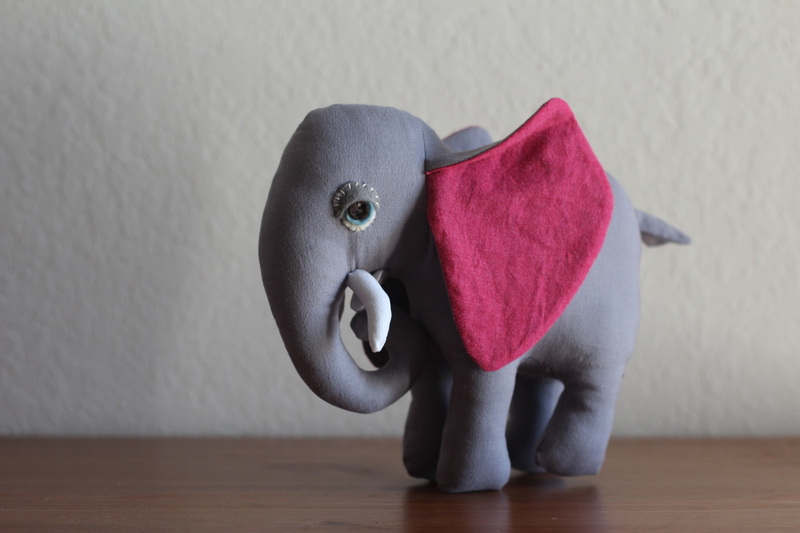 The fabric for the elephant's body is from a worn out cotton bed skirt, the ears from a scrap of pink cotton fabric, and the tusks from white muslin. The eyes, made from wool felt, are stitched on with thread and embroidery floss. 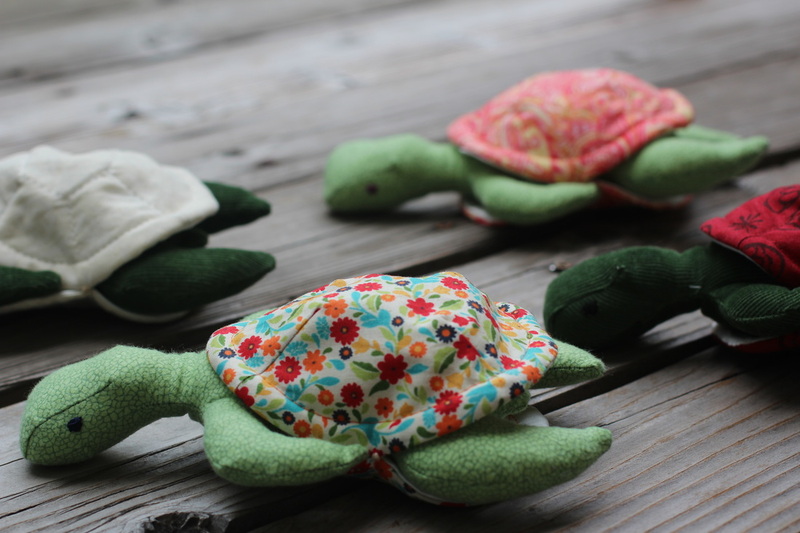 The Peek-a-Boo Turtle pattern is from the book Flip Dolls and Other Toys by Laura Wilson. The body fabrics are soft flannel and textured corduroy. The shells are beautiful quilting cottons that have been machine-stitched with spirals or hexagons. 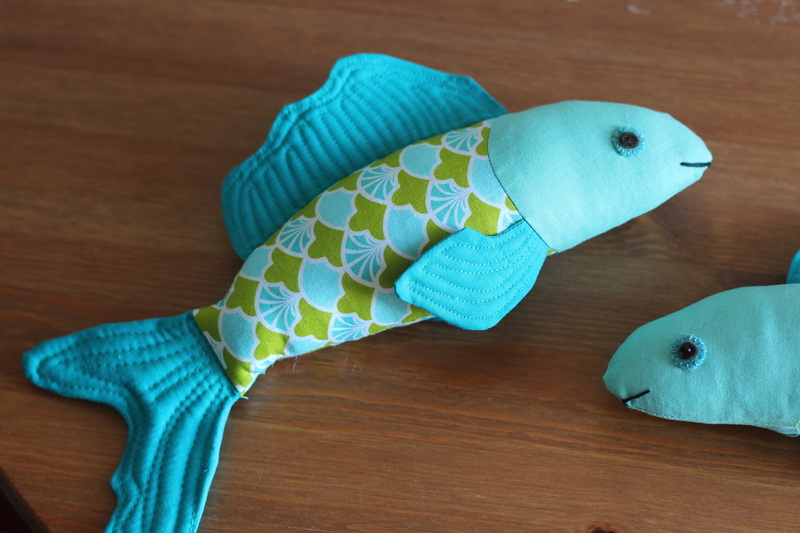 The basic pattern for this fish is from Abby Glassenberg's book Stuffed Animals. I added the quilting details on the fins to give them more texture and interest. The fabric (French Scallop in teal by Patty Young) creates the perfect fish scale look with a whimsical twist. The wool felt eyes are stitched on with embroidery floss and the mouth with the same. Based on a project in the book Quilt Improv by Lucie Summers, my hollow log project is the perfect addition to any imaginative children's play space. The wood grain fabric provides a touch of realism and the hole in the side with embroidered edge adds interest. An old-style address book with a twist. 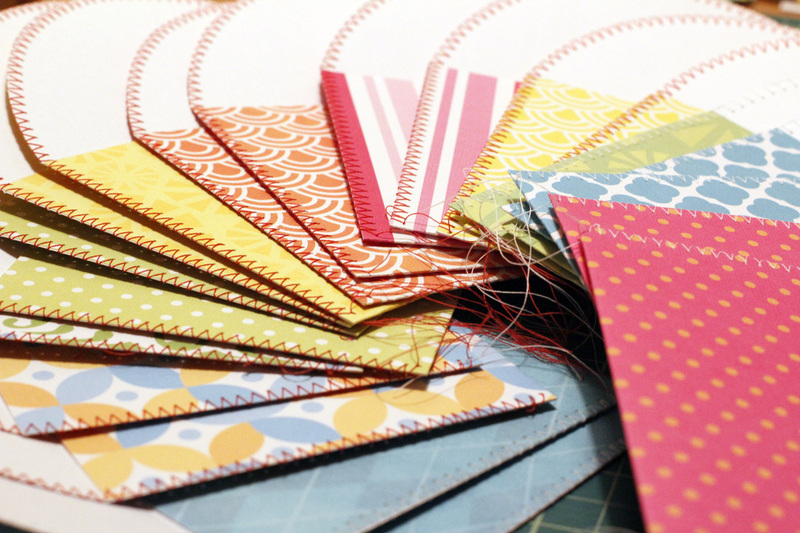 The pages are envelopes made from coordinating scrapbook paper that are connected together with decorative tape. 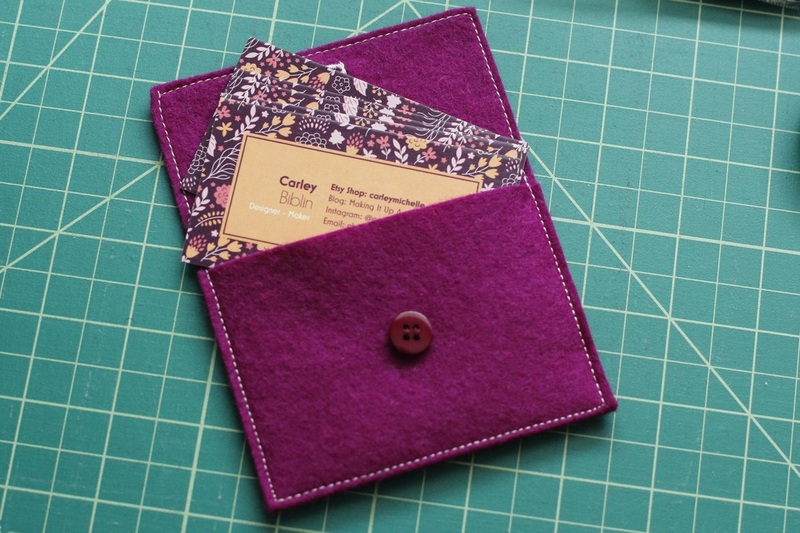 The resulting booklet goes inside the fabric cover. The endpapers are slid into pockets to keep it in place. 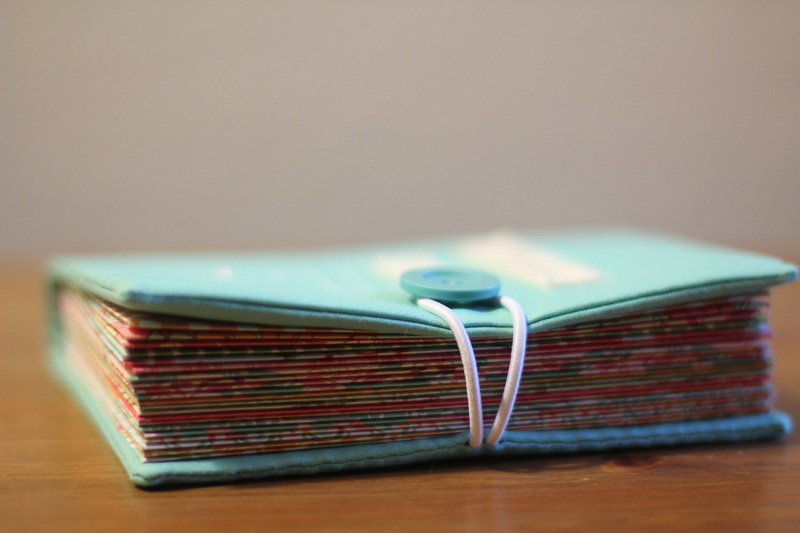 The cover is decorated with stamped twill tape and stitching. A button and elastic closure keeps everything safe. 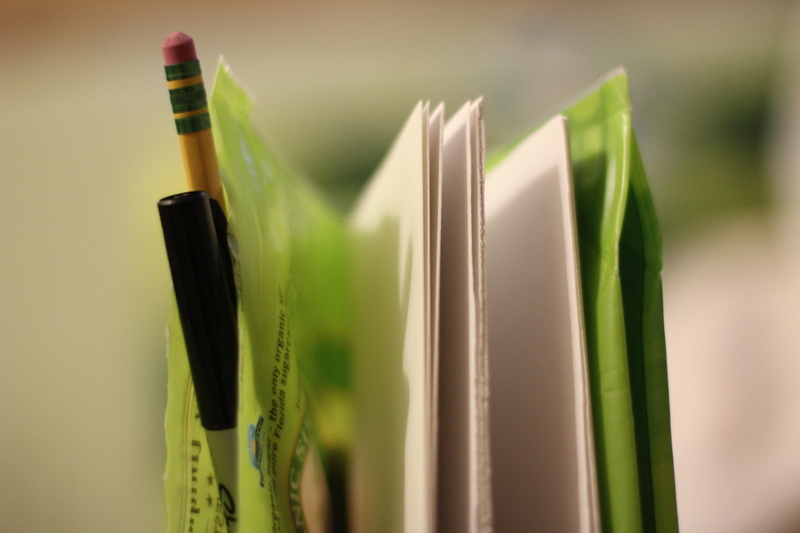 Addresses, labels, and stamps are stored inside the envelope pages. The inspiration for this project came from a commercially-produced pillow, but the process is completely my own invention. 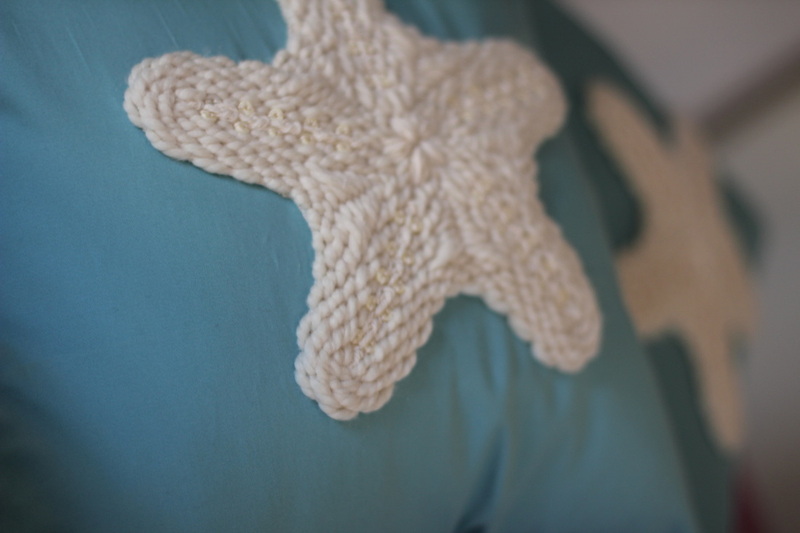 The starfish is embroidered with a wool blend yarn. The embroidery stitches and the disk beads create texture and interest. The applique is stitched onto a cotton envelope-style pillow cover in a teal that is reminiscent of the ocean. Using the pattern from Soft Animals A to Z by Carolyn Vosburg Hall, I constructed this bird from 100% wool felt. The feathers are machine-embroidered in matching thread and the individual pieces assembled with hand stitching. Facial details are felt and embroidery floss. 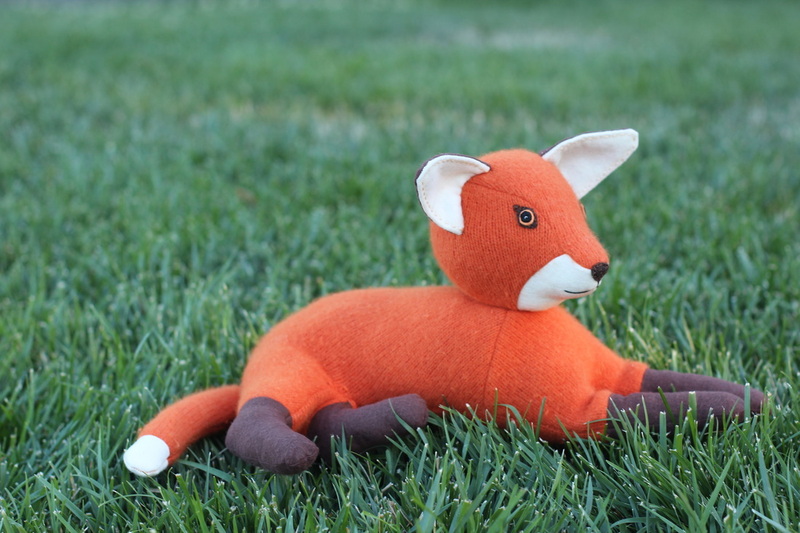 Made from an orange felted wool and angora sweater, wool felt, and flannel, this reclining fox is soft to touch. He was made by combining two different patterns from Jodi Davis' book Easy-to-Make Stuffed Animals & All the Trimmings. The embroidered felt eyes and nose give this fantastic fox lots of charm. My own version of the felted wool sweater blanket, this 100% cotton knit sweater is backed with white cotton and hand-embroidered with yarn that doubles as the quilting, keeping the layers in place. The circle motif is simple, bold, and fun. 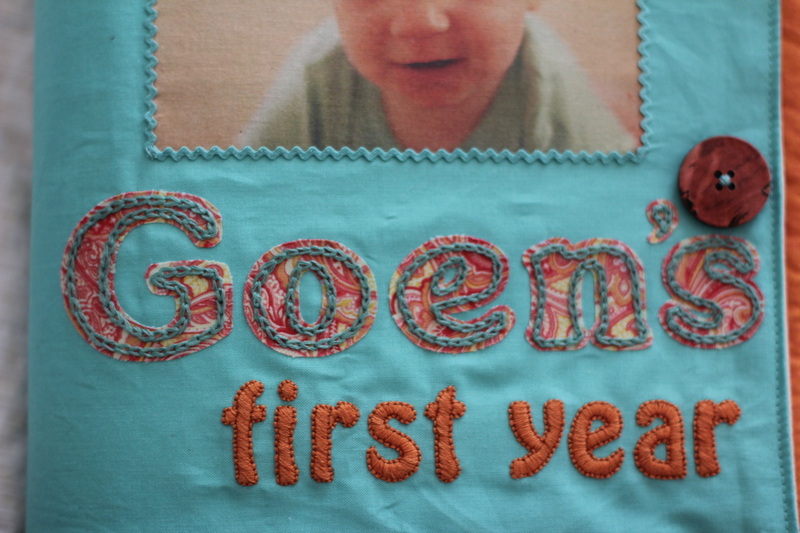 I wrote, design, and embroidered this fabric memory book for my son's first birthday. The photographs are printed on muslin that is fused to the page fabric. Each picture is embellished with ribbon or embroidery that secures it in place.